Inviting your team to Loc8 is an important step to establishing quick and effective communication between them, whether they are your staff or contractors, in office or in field, leading to on-time performance and successful job completions. This article takes you through the mandatory and optional steps of bringing your team to Loc8. 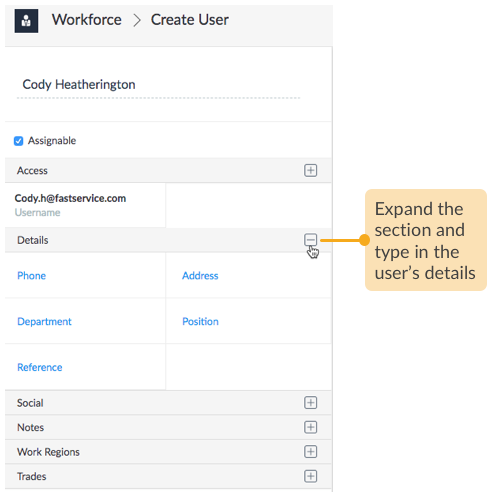 STEP 1 If this is the first time you are creating user profiles, you can use the Getting Started section on your screen as a guide to invite the first person of your workforce. 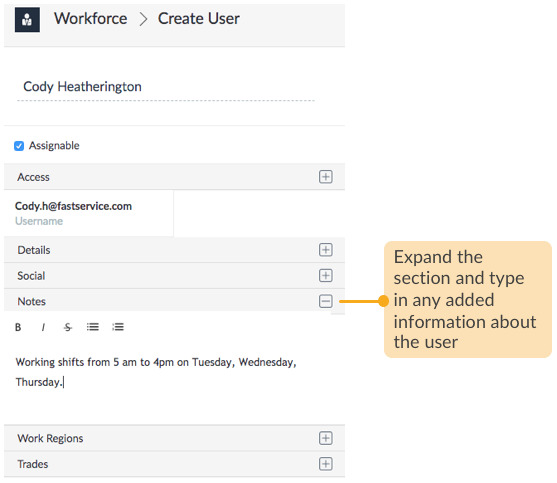 For subsequent user creations, go to the Workforce area. 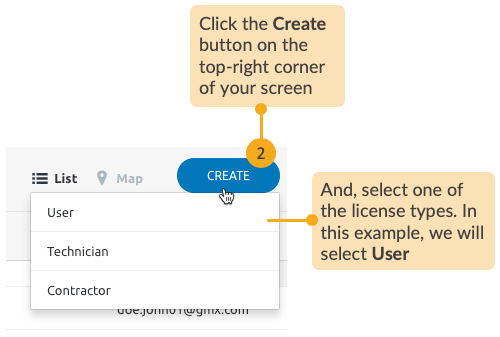 STEP 2 Select the license type. You might want to take a look at what each of these licences can and cannot do, and a bit more about how different is the Contractor license to the User and Technician license. Please read Introduction to Workforce. STEP 3 Fill in the general and company-related details of the person. 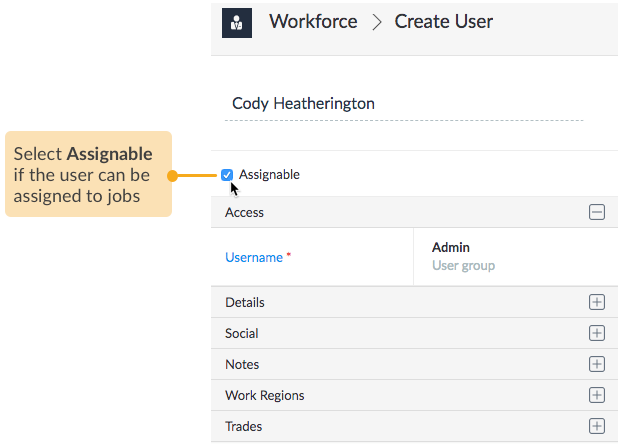 If a person under the User license needs to supervise or complete tasks at the customer location, you can make them available for job assignments by enabling the Assignable option. INFO: If for a User license you can select the Assignable option, it is mandatorily enabled for Technician and Contractor licenses. Ensure that the person's email address is a valid and active one. 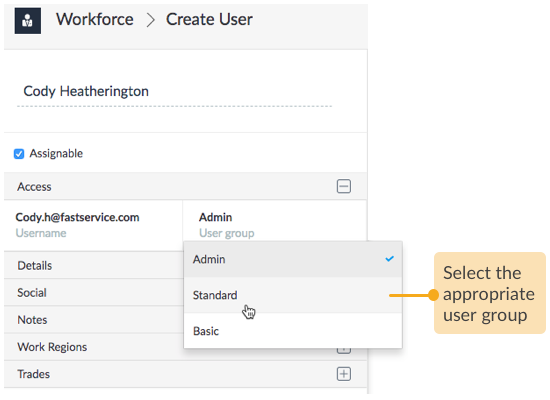 Select the user group that best fits the person's role and requirements on a day-to-day basis. NOTE: All the steps from here onwards are optional, though they help to complete the profile with detailed information. 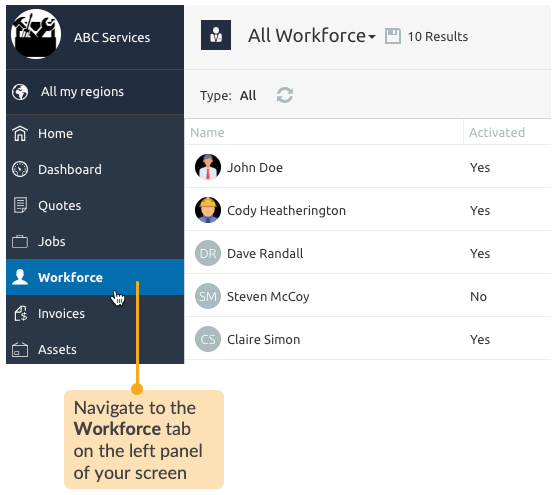 If you wish, you may fill them later and for now, directly jump to the last step to finish adding the person to your workforce. Fill in the contact details, department and position. 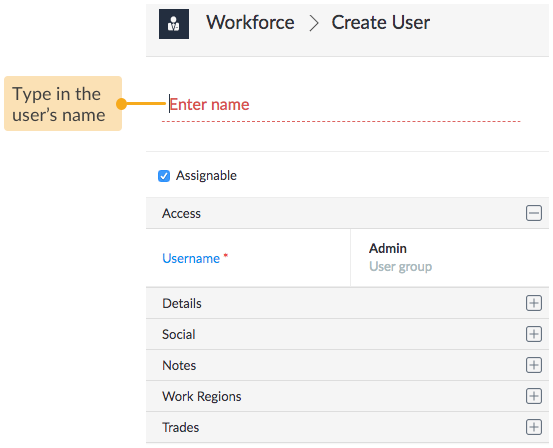 In Reference, you can enter their employee ID or any label to easily filter or search the person from a pool of workers. Fill in the links to the person's social contacts if available. Use Notes to capture any particular information about the person. 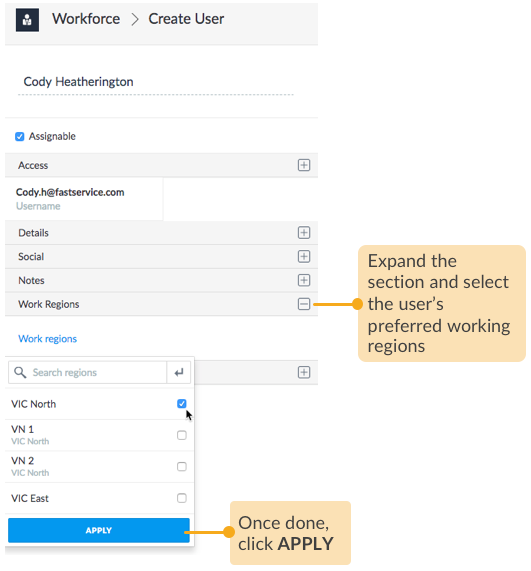 Tag the person with appropriate work regions so you can view the distribution of your workforce across a map and make smarter selections when assigning jobs. If the required region is not added yet, you can do that right now. 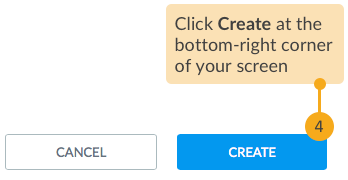 Just open Settings > Regions area in a new browser tab and add regions. Tag the person with appropriate skillset or trades to help you assign the right technician to a job. 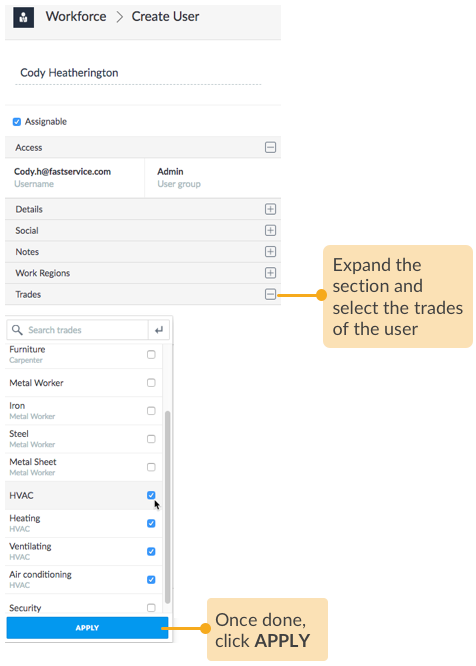 The Trades section is displayed for all technicians, contractors, and those users who are allowed to be assigned to jobs through the Assignable option. 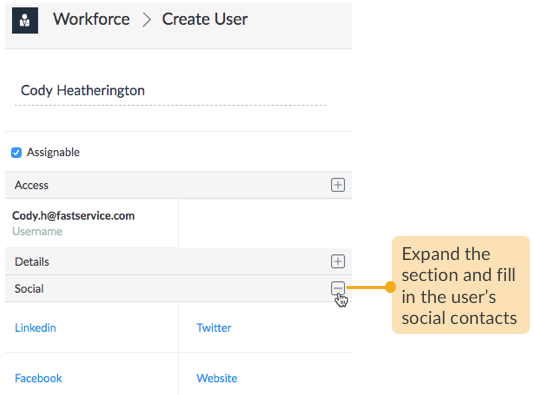 STEP 4 Lastly, go ahead and add the person to your workforce. 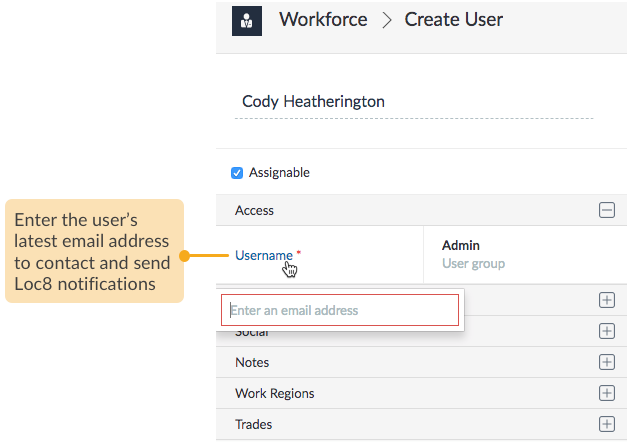 Next up, after your workforce accepts the invitation and activates their account, they can start using Loc8 via browser and Loc8 Mobile app as per their permissions.